living, or be able to do so, should the occasion arise." 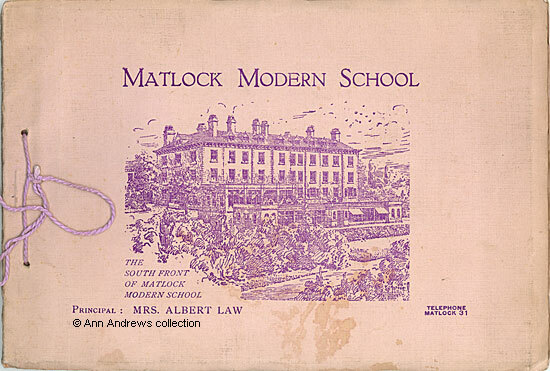 This prospectus was produced a few years after the school moved from Tor Cottage in Matlock Dale to its new home on Rutland Street and the date of its publication has been worked out from information about people mentioned in the text. Quotation marks indicate quotes from the brochure. 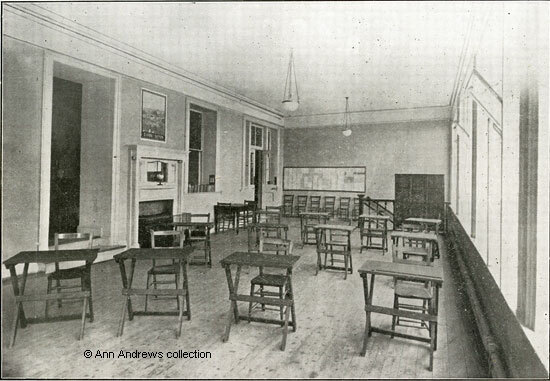 The school was opened on 11th March 1926 by Sir Henry Hadow (late Vice-Chairman of Sheffield University and Chairman of the Government Committee that issued the Hadow Report). He declared that "Modern education should give special attention to literature, music and the arts and crafts ... [giving] the pupil, when leaving school, a desire to learn more ... But whatever the subject, let their standards be high ...". 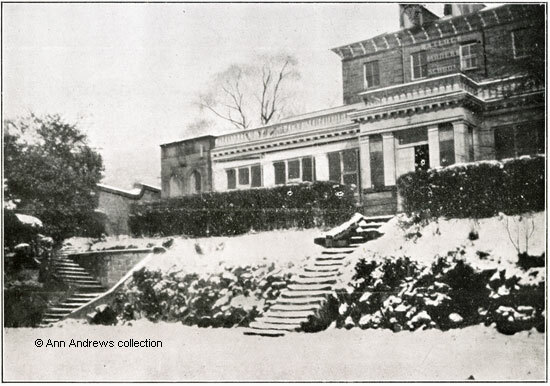 The premises were described as "700 feet above sea level, facing south, with magnificent views over the town and surrounding country". 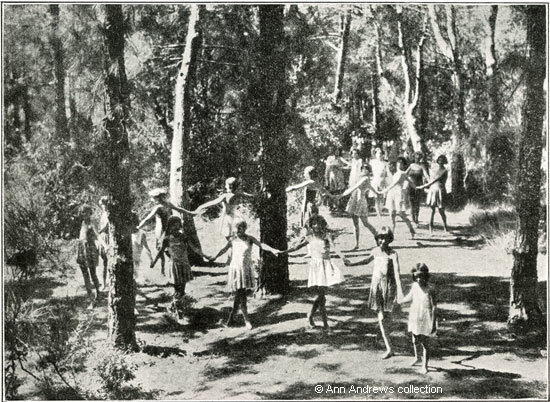 The school was considered to be in a healthy locality and its pupils were encouraged to lead a healthy, outdoor life. "Special attention is given to outdoor life with, as far as climate will permit, open-air games and classes, including Nature Rambles, Camping, Swimming in the Thermal Baths, Riding, Tennis Hockey, Cricket, etc." 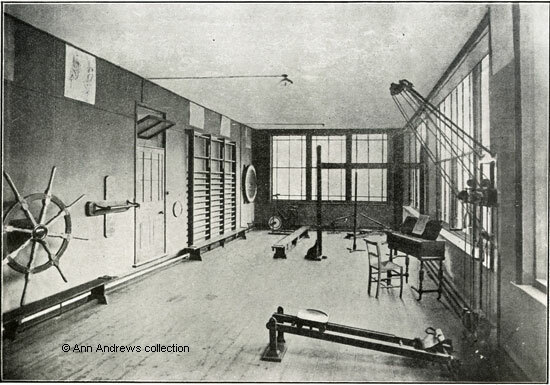 A sun-lamp, the first in the country in a private school, was installed "for the promotion of sound physical development". Its use was supervised by a trained nurse. The reason given was that the U.K. receives too little sunlight. The bedrooms were for two or three only - unsurprising as this had been a hydro and would not have been designed with large dormitories anyway. However, in the summer "there is excellent provision for sleeping out of doors, on the beautiful balconies, for those whose parents so desire". Some single rooms were also available. The school's name is on the wall above the south garden entrance. 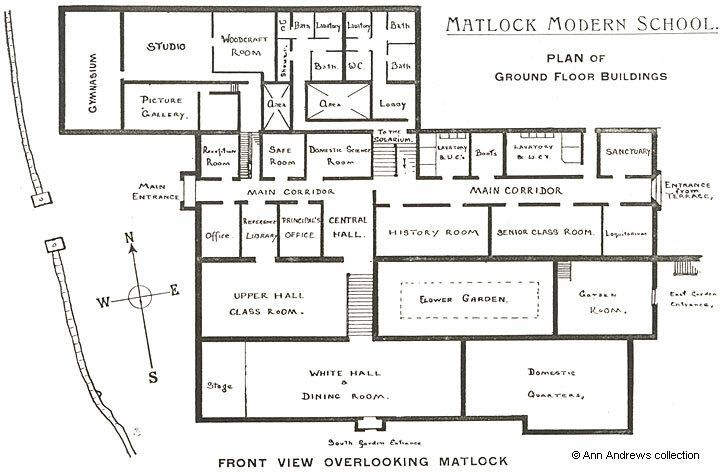 The ground floor plan at the bottom of the page shows that the White Hall and the Dining Room were one and the same. Upper Hall shewing Wireless Room. "A Wireless Equipment has been installed and is used by the staff and pupils for educational and entertainment purposes". "The School Course includes Religious Knowledge, English Language and Literature, History, Geography, Arithmetic and Mathematics, French, Latin, Elementary Science, Public Speaking, Theory of Music and Harmony, Class Singing, Drawing, Handicrafts, Plain Needlework, Home Nursing, Gardening, and Games". "A large studio is equipped for various handicrafts, including Painting, Modelling, Poster Work, Woodwork, etc. There is a special room for Woodcraft Work". "Much attention has been paid to the subject of diet, which includes plenty of fresh fruits, vegetables, green salads, eggs, milk and other diet rich in the essential vitamins. The food, too, is unlimited, as is necessary in the case of growing children". 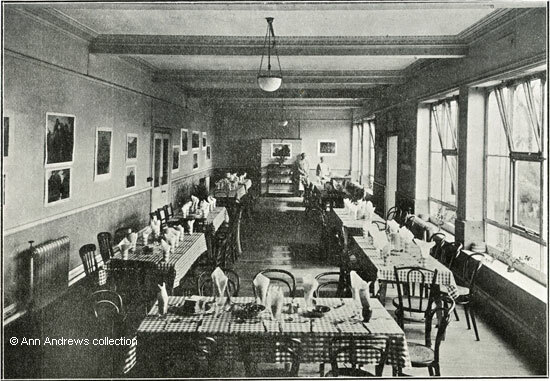 Note the two unidentified members of staff at the far end of the room, perhaps waiting to serve lunch. Continental Holiday - Locarno - Aug. 1927. 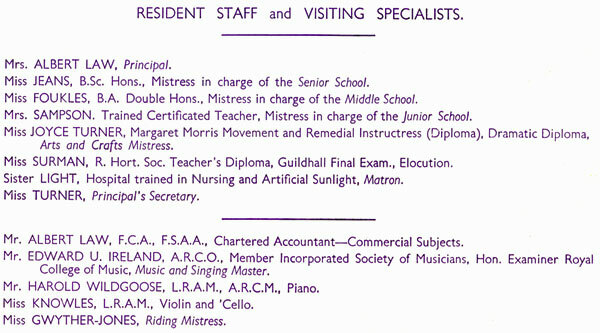 "An interesting feature of the School management is the organisation of inexpensive School Holidays abroad, and by this means large parties of the pupils and their parents, accompanied by the Principal and Warden, have been taken in recent years to France, Belgium, Holland, Switzerland and Italy. The pupils who wish to do so secure camping equipment, take these with them to a carefully selected site, and have a glorious time living in the open air, visiting the neighbouring villages, shopping and conversing with the people in the language of the country. These journeys give the pupils a savoir faire and travel experience, an added interest in languages, and self-reliance, all of which is immensely beneficial and broadening. One year a party of about thirty or forty pupils and parents visited Locarno on the Swiss-Italian Lake Maggiore, where a charming camp holiday was spent, including visits to the picturesque markets, bathing in the lake, interesting excursions to the many beautiful places on the lakes - Como, Lugano, Palanza, Isola-bella and Milan". 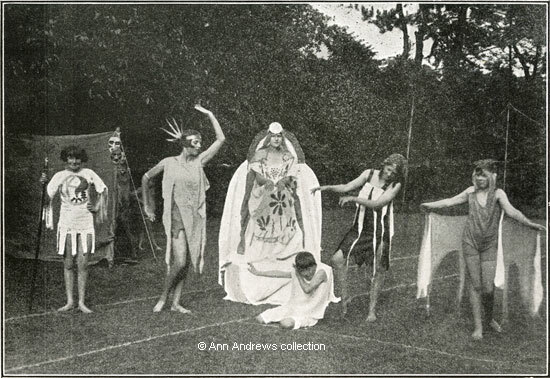 Margaret Morris Dancing [Photo: Fred Daniels]. Dancing was taught by "a fully qualified resident Instructress from the Margaret Morris Studios in London. ... Over 200 exercises are carefully graded from the simplest to the most complex, all with their appropriate music ... The exercises are carefully graded and chosen to suit the individual, so that faults of posture, etc., may be overcome. At the same time the exercises are interesting to perform because they are all compositions in movement, developing a natural grace through muscular control and balance". "The ethical value and educational service of plays, and especially of original productions among young people, have always been recognised and practised at the School. 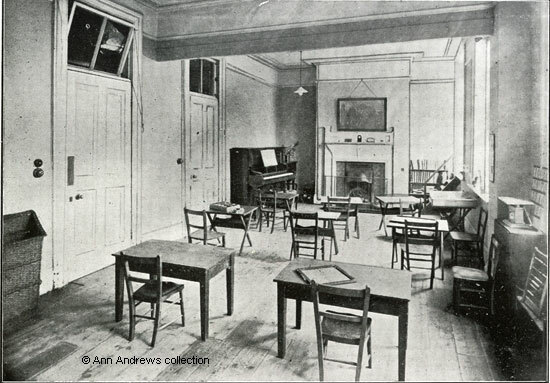 Some original Plays, including Mumming Plays, exceeding clever in construction and dialogue, and effective in inculcating some ethical truth, have been written by members of the staff, and produced and acted by pupils to large audiences, usually in the grounds of the school". "Full recognition is given to the importance in these days of meeting the requirements of modern conditions in the attainment of a high standard of education, and academic success. Members of the staff hold honours degrees". 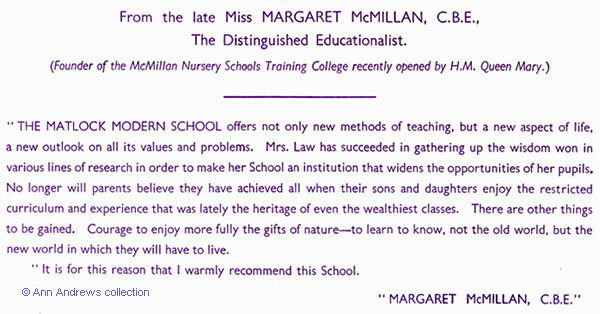 Mrs. Law believed in the same principles as Margaret McMillan (1860-1931) and such a warm recommendation must have pleased the school's founder. The words FRIEND TO ALL CHILDREN are inscribed on Margaret McMillan's gravestone (external link). 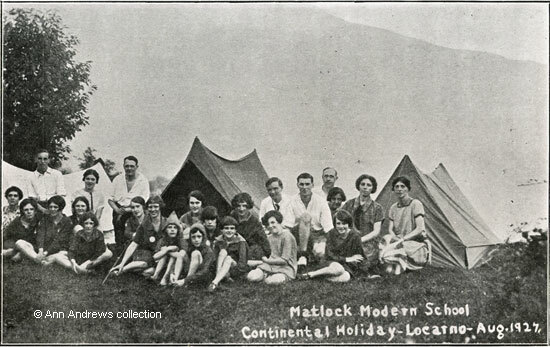 In the first week of September 1932 Sir W Arbuthnot Lane attended the first Summer School of the New Health Society, held at Matlock Modern School. He praised the school's methods and equipment and thought the school "a fine example to others in its ways and methods ... In this school they are trying to make healthy girls who will make fine young women." He is third from the right in the above photo. Mrs. Bertha Law is on the far right and presumably her husband, Albert is standing between the two. 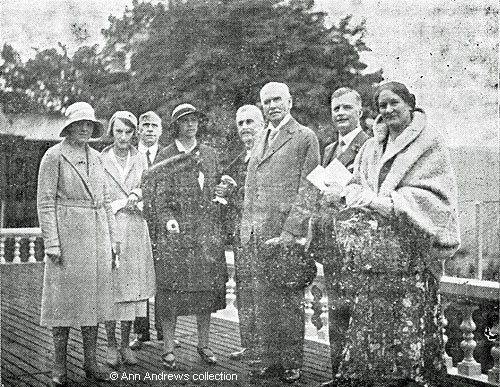 Also in the picture is the then Marchioness of Hartington who presided over the event. The prospectus was written not long afterwards. 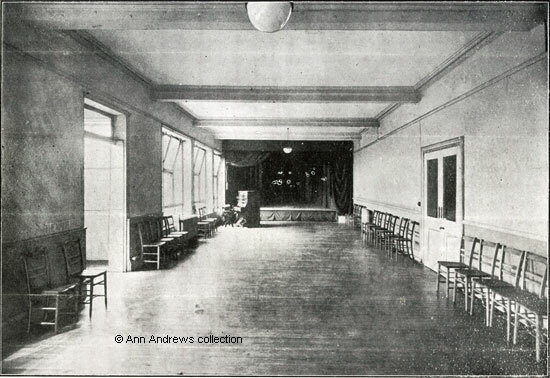 The room opposite the Sanctuary was the Loquitorium (parlour). Three images, showing the grounds, are not included here. With very grateful thanks to Mrs. D. Theophanous for giving me the prospectus and in memory of a former pupil of this school who had kept it until her death.. 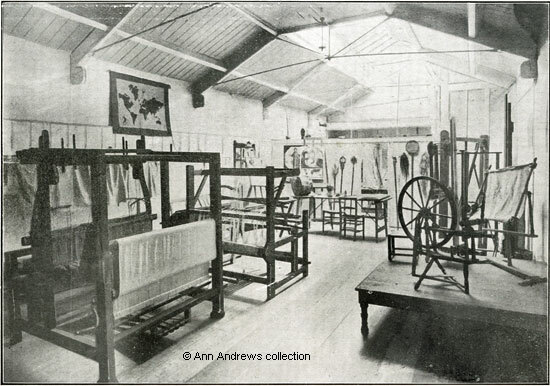 Prospectus in the collection of and provided by and © Ann Andrews.